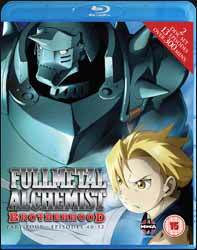 Part four of Fullmetal Alchemist: Brotherhood was previously released on DVD in June 2011. For reasons unknown, although I'm suspecting it's to wring out as much money from fans as possible, this Blu-ray collection is spread over two discs. The content would easily fit on one disc without any problem, so I'm assuming it's because charging £30 for a single disc would have the fans outraged. It's another strong collection, although if you already own the DVDs then you have to ask yourself whether £30 is worth shelling out for for the extra picture clarity. Personally, I would upgrade, but then I am a huge Fullmetal Alchemist fan. This collection contains episodes 40-52. We see how instrumental Hohenheim was in the birth of the homunculus Pride. Ed and Al are separated and have their own quests to follow in order to ultimately stop "The Promised Day" from coming to pass. All roads seem to lead back to Central for the big showdown... whatever that may be... no one is quite sure what it all means, but as the homunculi are all gathering it looks like it won't be a straightforward confrontation. The one thing I did notice much more rewatching this series is Akira Senju's incredible score. There are a handful of his powerful themes (in particular the John Barry James Bond-esque 'Fire in the Sky') that are played to heighten the tension of dramatic scenes, which would otherwise been only half as powerful. He also does creepy, melancholic and comedy without any effort. Extras are a little sparse and, like the DVD release, include audio commentaries on episodes 40 and 46 as well as textless opening and closing titles. It's great to finally have these episodes on Blu-ray given the added picture definition.